Bottle-Free® Coolers: Rent for only $38.95/mo. Contaminants may not be in your water. Prices and participation may vary. See your local dealer for details. Not valid with other offers. Limited time offer. Financing offer for qualified buyers. Always able to call and get what we need help with in a reasonable amount of time. Staff is friendly and helpful. Once you’ve had RO drinking water, all other water, including bottled, tastes lousy. We love it! Scott and Lance are high quality people who provided exceptional service and knowledge for me. I will only call on them when it comes to softeners and RO systems! 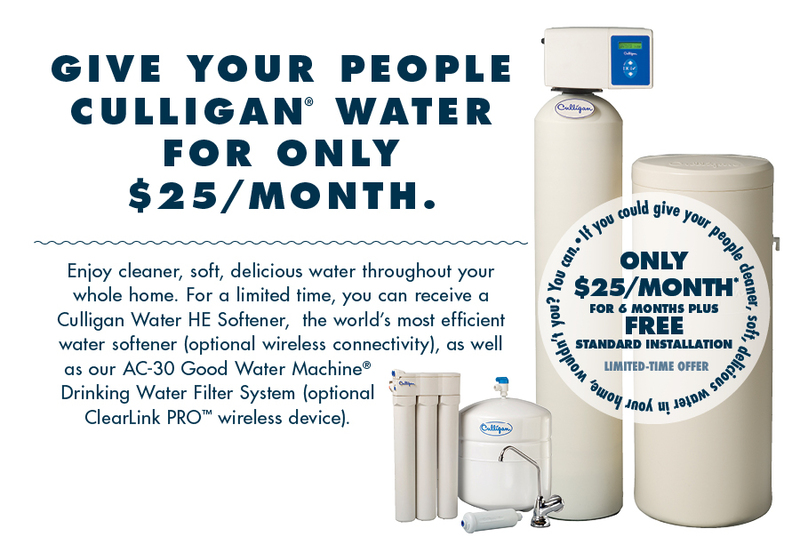 Thanks Culligan! My old water softener stopped working, so had a new one installed by Culligan. Friendly, fast, and efficient. Took the old one away and the new one is working great! There was an issue with the initial installation, but the company took responsibility and made things right for us. The system is working great since then, and we are happy with the quality of the product & service.